Are you a digital nomad or budget traveler who is heading to Borneo? How about Malaysia in general? 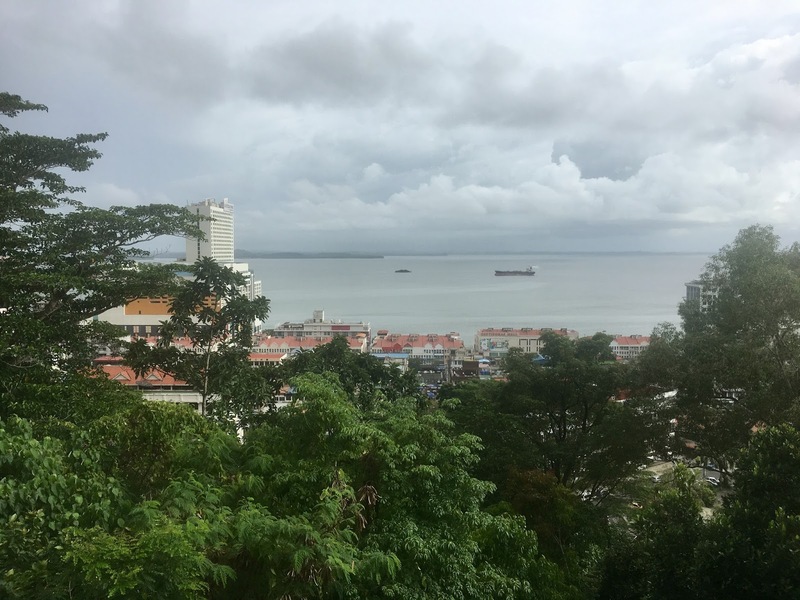 Here is our city review for what it's like to live in Sandakan, Sabah, Malaysia, a good starting point for Borneo jungle adventures. We left Sandakan the other day! 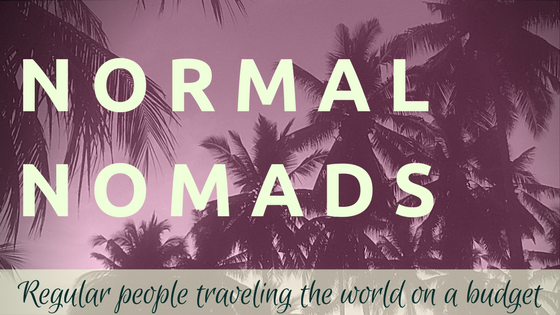 So, as we (Monica and Warren, the Normal Nomads!) discussed the pros and cons in preparation for this review, we kept coming back to this point: We don't think anyone is going to try and live in Sandakan. Sure, people do live there, and we imagine they do so happily, but we just couldn't figure out a reason for someone to voluntarily move there as a nomad (thus, not location dependent for a job). And this isn't because Sandakan isn't a pleasant town! It is just that Sandakan is a small town and its principle purpose for visitors is to act as a starting point for a journey to see monkeys and elephants. And these activities are pretty expensive, not helpful to a person trying to live on a budget (although we totally did them, check out our spotlight on the Kinabatangan River). As a comparison, think of Rapid City, South Dakota. Sure, it is a nice enough town (oh hi Aunt Carol! ), but if you ever find yourself there, it is only because you are off to see Mt. Rushmore the next day. You are probably on the edge of your seat, what with our semi-spoiler start this article, so without any further hesitations, how did Sandakan do???? 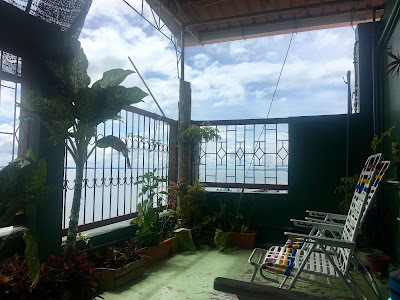 place to look for pleasant views? 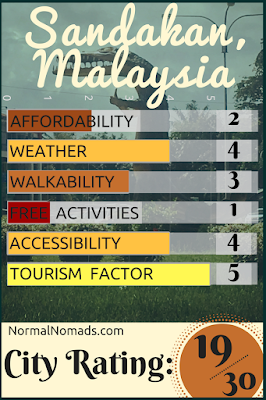 Sandakan gets the same Affordability score as Kuala Lumpur and Kota Kinabalu, the other Malaysian cities we've visited. There was nothing cost prohibitive about living in Sandakan... barely. Food costs were a little higher at the store than you'd find in Penisular Malaysia. There was a pack of instant noodles (duck flavor, super tasty!) we've bought throughout Malaysia with the price printed on the package itself (3.80 ringgit). We bought these noodles in Sandakan for 4.80 ringgit. Yes, this was only an extra quarter for you Americans, but these slight price hikes were ubiquitous and eventually added up. An odd thing we ran into, on our predictable search for booze, was that none of the alcohol we found was over 17% ABV (for those teetotalers out there, ABV stands for "alcohol by volume"). Some of the bottles were the exact same as we found in Kota Kinabalu (also in the state of Sabah), but whereas in KK they would be 35-40% ABV they were only 10% ABV in Sandakan. We bought one of these bottles (brandy maybe? Doesn't really matter, they were all a distilled palm sugar wine)... and it tasted just like a normal bottle of booze cut with a bunch of water. No shockers there. If you did want to buy a beer, expect to pay 7 ringgit (~1.75 USD) for a can (~350 ml) or 17 ringgit (~4.25 USD) for a bottle (600 ml). Did you notice that it is cheaper to drink cans than bottles? We did too. Conclusion- Sandakan was not the place to live to maximize money stretching. Clouds over Sandakan! And clouds are a part of weather! This photo is relevant! Days get hot, nights get only slightly less hot... this is the sort of thing you expected in the tropics, yeah? The heat never bothered us too much, we even took an hour long walk in it (exposed almost the entire time... more about that in "Walkability") without dying. And getting to sleep was never an issue provided we had an air-conditioner or a fan (that worked). It tended to rain in the afternoon, so we planned our days in such a fashion that we weren't out and about during the afternoon. The only problem we had with the weather in Sandakan was the humidity and lack of constant breeze. Just before a storm would roll in you'd get all sorts of wind, but otherwise it was still. This led to all of our clothing becoming all sorts of horrible smelling rot. We just couldn't get our clothes to dry fast enough! We tried everything we could think of but we ended up smelling pretty bad. The view from the roof of our hostel, where we were typically found. Walking around Sandakan was not difficult. It wasn't a large city and you could easily walk from one side to the other in a quick afternoon. As long as you stayed in the downtown part of the city, you were under cover, but leaving that meant being exposed to the sun and rain. 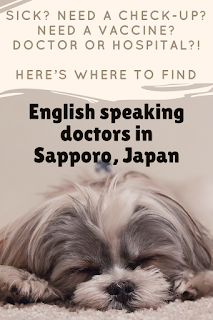 The main difficulty with walking, however, was the question, "Why?" We did the heritage trail, which was nice, and we'd walk to the grocery store every few days (less than 100 meters from our hostel), but beyond that, we simply couldn't find any reason to go out and walk at all. Something to walk on (that isn't a busy road)"
There were plenty of sidewalks in Sandakan, just not many places to go. We will get into this more during the next section. Conclusion- Walking in Sandakan was all journey, no destination. but the photobomber behind Monica cracked us up so much we had to include it. As anyone who did not grow up on a major body of water will ask you, why would you have a large body of water available and not make it a fun place to be? Sandakan happened to be on a large body of water. Like right on the Sulu Sea. And we found a few restaurants overlooking it. That's it. No boardwalk. No lookout points. No freaking benches to sit on while watching the clouds over the ocean. Also, the shore was lined with large bits of concrete (prevention of erosion, we assumed), which had become the home of all sorts of creatures. Seemingly, these creatures (which included a thousand cats and one very large monitor lizard fat on cats) existed to use these bits of concrete as their personal toilet. My point? They stank. So even if we could have walked along the water, would we have wanted to? 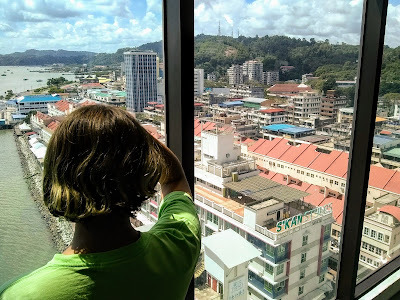 Beyond the water, we never did find anything much to do in Sandakan that didn't cost money. Even the best parts of the heritage walk had a fee to get in (the Agnes Keith House, which was pretty okay). The museum was free but very underwhelming. It entertained us for all of about 20 minutes. Most days, we would hang around our hostel all day, waiting for dinner time so we could finally have an excuse to leave. Sunset overlooking the Sulu Sea. Sandakan had an airport very near the city with flights directly to Kuala Lumpur. Too easy mate! 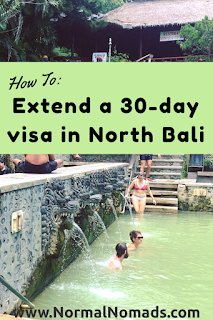 Malaysia had a three month free visa for visitors that was as easy as could be to get. No dramas! The only drawback to travelling to Sandakan was the price. It was a little bit more to fly to than other Sabah cities (Kota Kinabalu). Conclusion- Getting to and from Sandakan was pretty painless. but we only took six pictures in Sandakan and this photo had to go somewhere. Since the majority of people who visit Sandakan immediately leave Sandakan for the Kinabatangan River or some other amazing destination, the city has adjusted to tourism in an ideal way for someone who lives there. 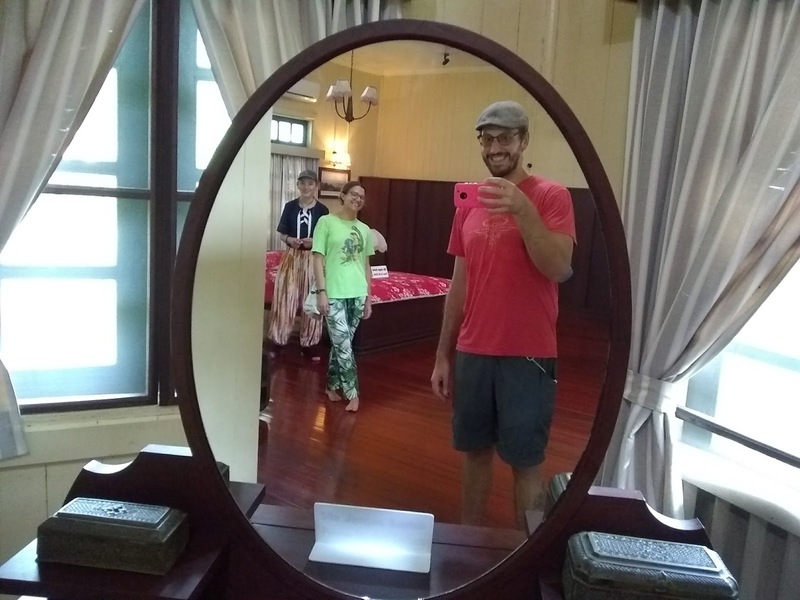 The internet was pretty solid, many menus were either in English or had pictures, grocery stores had western staples (peanut butter, cheese), and there were a plethora of people willing to help you get to where you need to get (provided it was the Kinabatangan River). But, as these tourists don't stick around, there wasn't any of the gaudy, tacky, and exploitative grabs for more of your money (we say this a lot, but think of Disneyland, where if they could find a way to charge you for breathing they would). Best of all, everything we saw had a price on it. This meant we knew what we were going to pay for something before we bought it and prevented an unscrupulous salesperson charging what they thought we would pay for it regardless of the price. *Fun side note (one that did not impact our score at all): Sandakan has historically had problems with pirates landing and kidnapping people. Seriously, this was a thing. Malaysia, specifically the Sabahan government, along with the Philippines have worked very, very hard preventing pirates and have had a lot of success. However, if you read any online forums about Sandakan, pirates will come up again and again. Please don't let this deter you from visiting. This sort of sensationalism might sell newspapers, but it does not reflect any reasonable chance of danger. Conclusion- All the good, none of the bad, Sandakan nailed it. 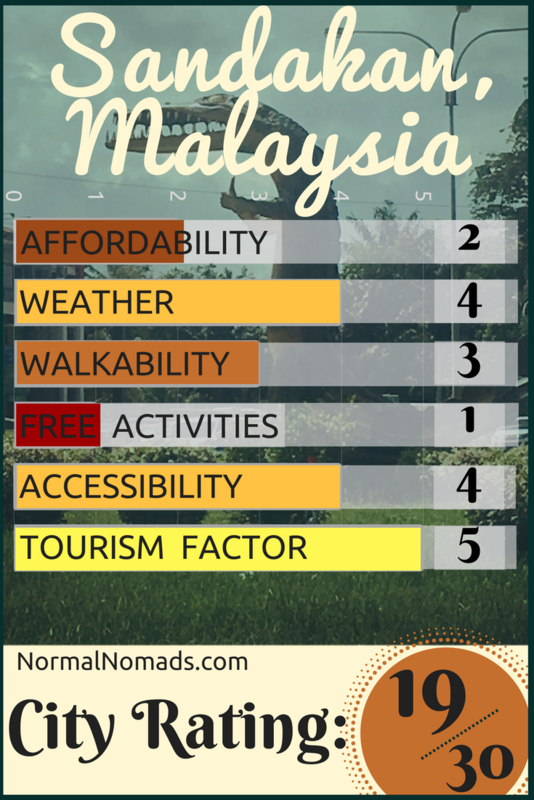 So if you are digital nomad looking to stretch your money are far as you can while having a nice place to work/play, perhaps you should skip Sandakan in preference to other places. But if you are looking for a starting point to get up the Kinabatangan River or meet sea turtles or go deep into the Borneo jungle, Sandakan can be that city for you.